It’s easy to decide on your pearls for that upcoming wedding or that simple pendant for a picnic in the park. But some events call for something in-between. This would include a work-related party or a PTA meeting or a semi-casual first date or an important family affair, like a 25th anniversary party. Times like this, it’s nice to accent a little bit more. There are those in between places you go, where slightly dressier attire might be called for. A simple dress or a modern looking pant suit is the likely choices for things like this. 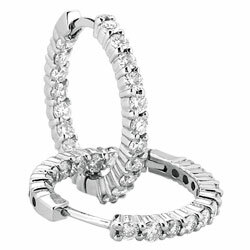 There is such a wide variety of mod looking jewelry available that have classy looks. Outfits like these ask for a little more than the simple little chain and pendant. The newer pieces like solid silver neck pieces with a stylish slide pendant are great for dressy casual wear. Cuff bracelets and bangles made from all sorts of metals are appropriate as well. Just do not over do your jewelry in comparison to your clothes. The most fun occasions to wear jewelry are those occasions when we have the opportunity to break out our nicest pieces and can wear them to the elegant places we love to go. Things like plays and fancy restraints are the perfect reason to wear our bigger diamonds, strands of beautiful pearls, and luscious colored gem stones. If you are like most of us these chances do not happen everyday, so put on your most glamorous jewelry and look like a million! 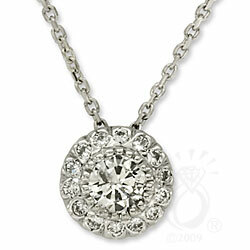 Classic Sweetheart pave necklace with 1/5ct t.w. round brilliant stones set on an 18″ cable chain. Fits a 4.5mm (1/3ct diamond) round center stone. (setting only, does not include center stone). How to NOT be a Fashion Victim!